The wedding morning is a significant part of your big day and should be a relaxed and ‘fun’ few hours; a breakdown will be worked out depending on the numbers in your wedding party and the restrictions we may have to work around. Understandably, the majority of brides want a natural make up look for their wedding; but whatever ideas we put together, your hair and make up will last all day without the need for touching up. It is important to build a relationship with your hair and make up artist and often it will be one of the first things you book so, with this in mind, Rebecca offers a free consultation to all her brides where you can meet and chat through ideas before making a final decision. All brides are strongly advised to have a hair and make up trial 6-8 weeks prior to the big day, where you will receive expert advice on hair and make up styles that will enhance your individual image and we will create your perfect look together. However big or small your wedding package is, if you put your wedding morning in Rebecca’s hands you will walk down the aisle looking and feeling your best. 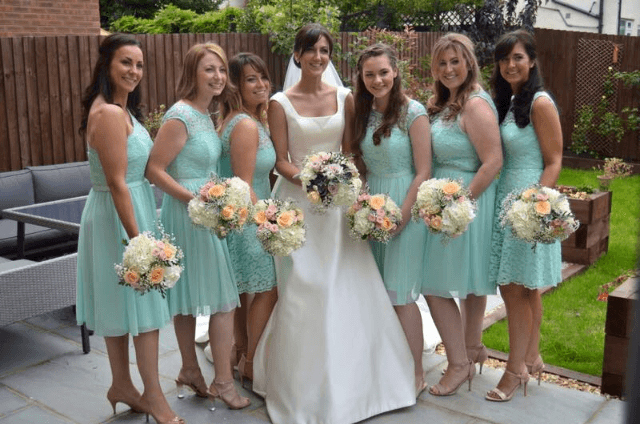 Rebecca can provide the full package for all her brides and other clients; she understands life is busy, especially when planning a wedding, and it important to look after yourself. At the beauty shed, brides can visit for all of their pre wedding treatments, body wraps/facials/nails etc to help them enjoy the process of planning the wedding. She also offers hen do packages for intimate groups and we can tailor a selection of treatments to suit your preferences and party size.